The Apple iPad – it was the breakthrough that finally after at least 20 years make “slate computing” something real. How many iPad-like devices have been announced now? 100? For you Mac Haters out there, how about the IBM PC AT, Lotus 1-2-3, AutoDesk, and a couple thousand other apps that created a whole new way of using a computer? The defining thing about these Breakthroughs is until someone, somewhere, somehow creates an actual working version of it, most people literally cannot imagine it, and even the most starry-eyed tech idealists will only see the glimmering of what could be. Two such products came out this week I’d like to recommend you get your head around because they will alter your world tech view. Hell, there are both (as of now) free. First is FlipBoard for the iPad. I was lucky to see Flipboard in action about 2+ weeks ago, so I’ve had a little more time to mull it over and have been using it since the hour it became available. You can read all the details starting here but I can tell you two things from my own experience: it redefines for me where news comes from and adds a whole new purpose and reason for “doing” social media. That’s Big. 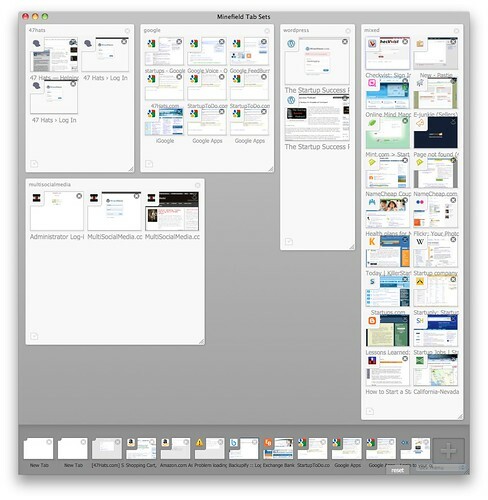 Tab Candy lets you create sizable, moveable groups of tabs. Working on one thing with its 8 tabs open, but you need to flip over to the 6 tabs social media tabs you have open? Two. Clicks. Definitely watch the video. Even it it’s a an alpha product on a developer build, this version of Firefox with Tab Candy is 10x more valuable to me than Chrome – my browser of choice. Of course both FlipBoard and Eye Candy have rough edges, will be copied, probably improved upon, and endlessly lauded over and railed against on the interwebs. My point is you should be on the lookout as a startup or microISV for just these kind of breakthroughes to spark ideas in your head, and if you’re lucky, your own breakthrough. Because everything is impossible – until it isn’t.